Sony Music generated 303.65bn Yen ($2.7bn) from recorded music in the nine months to end of September. That was 8.2% up on the equivalent period in 2016, when the company’s labels posted 280.65bn Yen ($2.5bn*). Streaming contributed 129.23bn Yen ($1.1bn) of this 2017 nine-month recorded music figure – or 43% of the total haul. 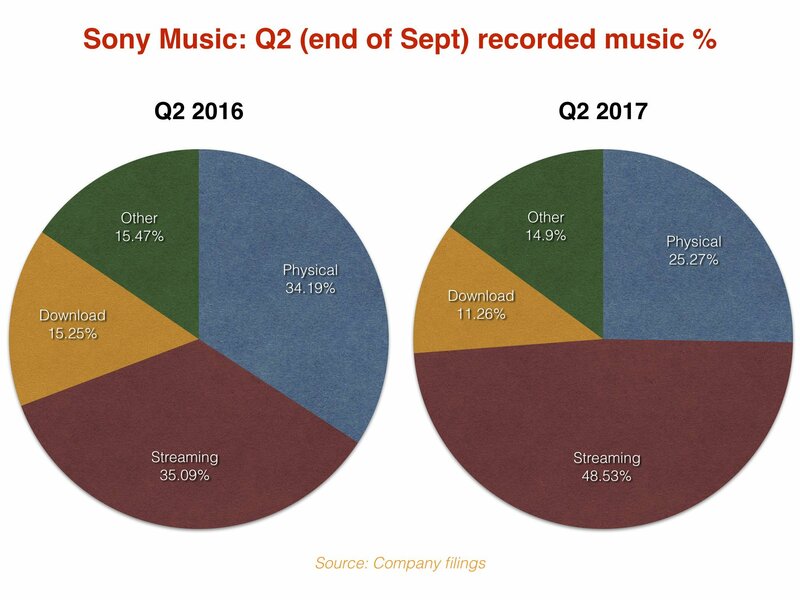 That streaming figure was up 37.2% year-on-year on the 94.18bn ($840m*) posted from streaming by Sony in the same nine months of 2016. MBW has previously forecast that the three major labels combined will post $5bn in streaming sales this calendar year: we’re on track. Physical formats generated 87.62bn Yen ($783m) at Sony’s labels in the first nine months of 2017 – down 5% on the 92.26bn Yen ($824m*) seen in the equivalent period of the prior year. And recorded music downloads brought in 39.62bn Yen ($354m) in the Q1-Q3 2017 period, down 22.1% on the 50.89bn ($455m) the format generated in the same period of 2016. The reason MBW can make these calculations is because Sony Corp has just posted its quarterly results for the three months to end of September this year (its fiscal Q2). Sony Music’s recorded music revenues hit 109.18bn Yen ($984m) in this quarter – up 21.6% year-on-year. Some 49% of these quarterly revenues came from streaming. The format generated 52.99bn Yen ($477m) in the three months for Sony labels, up 68.3% on the equivalent Q2 figure in 2016. That means Sony is now generating over $5m a day from streaming services. Here’s a handy at-a-glance comparison: according to the other majors’ latest results, up to end of June, Universal Music Group’s labels were generating circa $6m a day from streaming, with Warner’s on $4m a day. 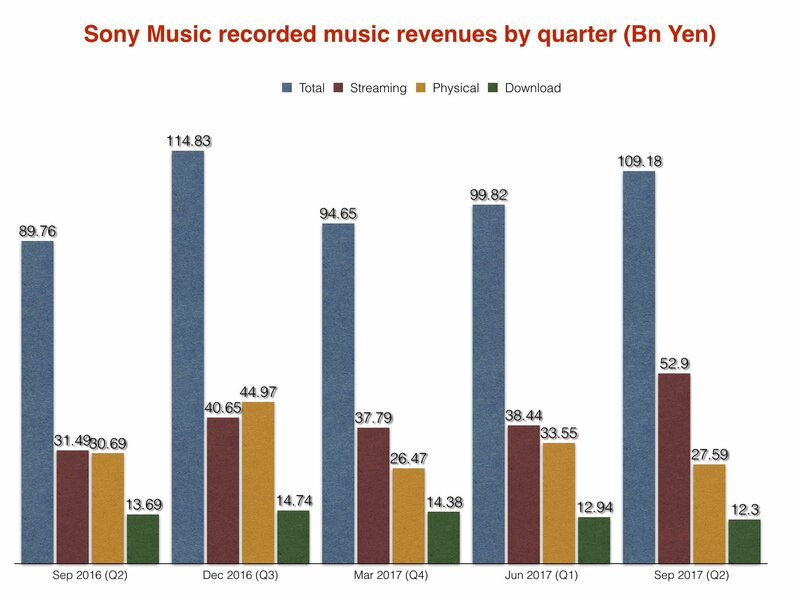 Physical formats contributed 27.59bn Yen ($249m) at Sony Music’s labels in the three months to end of September this year. That worked out at 25.3% of total recorded music revenue, and was down 10% year-on-year. Downloads generated 12.3bn Yen ($111m) in the quarter, down 10.2% on the equivalent period in 2016. Best-selling titles during the three months included Nogizaka46’s Nigemizu and DJ Khaled’s Grateful. Sony’s publishing division – which includes Sony/ATV worldwide and Sony Music Publishing in Japan – generated sales of 19.5bn Yen ($176m) in the quarter, up 25.1% year-on-year. 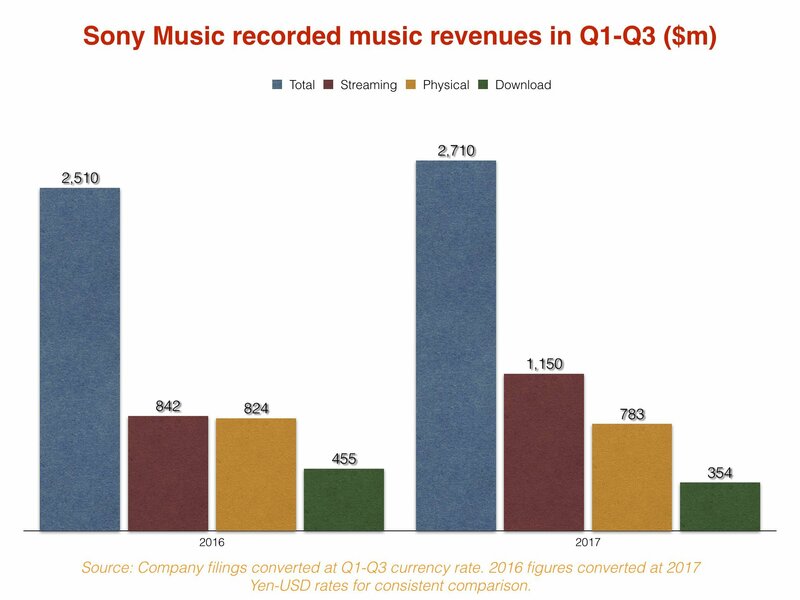 Sony Corp’s total Music category – which includes recorded music, publishing and ‘visual media and platform’ divisions – posted revenues of 206.6bn Yen ($1.9bn) in the three months. That was up 37.5% on the prior year quarter (or 32% at constant currency). Sony Corp’s overall Music division also posted a quarterly operating income of 32.5bn Yen ($293m), up 96.9% year-on-year. Sony Corp has now revised its full year forecast for its Music division (once again – this includes recorded music, publishing and ‘visual media and platform’ which bundles in things like sales of certain mobile games). The company says it now expects its total music revenues to hit 730bn Yen in the 12 months to end of March 2018 – the equivalent of over $6.5bn. It also anticipates a music division operating income of 94bn Yen – equivalent to approximately $840m, or a 13% profit margin.